Transform the lives of people with disabilities and neurological motor disorders to help them as independent as possible with our BA (Hons) in Conductive Education. Delivered by the National Institute of Conductive Education (NICE), this unique course is the only one in the UK to qualify you as a professional conductor to work with children and/or adults with physical disabilities. What's covered in the course? The course is structured across six semesters. Each semester lasts 15 weeks, therefore you are expected to study for a minimum of 30 weeks per year. Over the three years you will learn about topics such as neurological motor disorders, the professional skills needed to teach and develop skills including movement, confidence, understanding and communication, conductive practice and the work of professionals in the field. You will be taught at the Conductive College, located in Moseley, which is a dedicated training space specifically for professionals, families and carers in the field of Conductive Education. Courses, leading to a qualification, will be accredited by Birmingham City University. The conductive college is a key tool for the development of Conductive Education in the future and an essential part of the work of the NICE - the unique charity that believes every person with a movement disorder has the right to specialised services which meet their needs. You will also start to learn about carrying out research and begin to investigate theoretical concepts in the light of practical experience and knowledge. By the end of the course, you will have covered a range of academic subjects, all of which will enhance your ability to work as a professional conductor in a range of different countries or cultures. Benefit from our partnerships with industry - gain practical experiences both at NICE in Birmingham, as well as a range of schools and CE centres across the UK. With a strong theory-practice link, this course will give you to develop your own professional skill base and academic potential. Gain valuable employability skills - you will graduate from this course able to work in centres, schools and units all over the world, enabling you to seek employment in a range of different countries or cultures. Continue on to further education - you will develop your knowledge, understanding and adaptability, providing you with a solid basis from which you can achieve qualifications e.g. PGCE. We want our students to achieve their full potential. So, if you receive a Special Unconditional Offer from BCU and then go on to Meet or Beat our published entry requirements, you could be eligible for a £1,000 scholarship. *Term and Conditions apply - some undergraduate courses are not eligible for this scholarship. We would normally expect you to hold at least 96 UCAS points from A2 levels or equivalent qualifications such as Access to HE Diploma (preferably in a relevant subject area), of which you must obtain 60 credits in total to include at least 2 Merits at Level 3. You are also required to hold GCSEs in English Language and Mathematics, plus two further subjects at Grade 4 (previously Grade C) or above. Other qualifications or relevant experience will also be taken into account. Suitable applicants will be invited for an interview and acceptance onto the course will be confirmed following the interview process. As part of the selection you will be required to successfully complete an enhanced disclosure via the Disclosure and Barring Service (DBS). If you have a qualification that is not listed in the table please refer to our full entry requirements on UCAS. Further guidance on tariff points can be found on the UCAS website. Worried about exams? Don't be. We've put together a whole host of resources including student tips and expert advice to help you nail your exams. You can even get a free revision guide. The NICE website provides an opportunity for employers and employees to advertise jobs and staff. As a training college we have solid links with many CE centres both nationally and internationally. Many students gain experience in these centres throughout their training, giving them relevant experience and exposure to these centres and the opportunities they present for future employment. Sorry, this course is not available to international students. The University reserves the right to increase fees in line with inflation based on the Retail Prices Index or to reflect changes in Government funding policies or changes agreed by Parliament up to a maximum of five per cent. UK and EU students applying for most undergraduate degree courses in the UK will need to apply through UCAS. The Universities and Colleges Admissions Service (UCAS) is a UK organisation responsible for managing applications to university and college. Your personal statement is a highly important part of your application. It gives you a crucial opportunity to say why you’re applying and why the institution should accept you. Why does this course appeal? What areas are of particular interest? If you have a specific career in mind, say how your chosen course will help you pursue this goal. Mention any work that is relevant to your subject, highlighting the skills and experience gained. Highlight skills gained at school/college, eg summer schools or mentoring activities. eg Duke of Edinburgh Award, Young Enterprise scheme. You should also mention your future plans – if you’re planning to take a year out, don't forget to give your reasons. Talk about any subjects you’re studying that don’t have a formal assessment and any sponsorships or placements you’ve applied for. And don't be scared to add in details about your social, sports or leisure interests. Get more information on writing personal statements. We offer a wide range of professionally accredited and vocational courses that require the purchase of, among other things, uniforms, equipment, subscriptions, professional body memberships and DBS checks, and may require you to pay to attend conferences or participate in placements. The link below provides our estimate of the possible costs associated with key activities on specific courses. Please bear in mind that these are only estimates of costs based on past student experience and feedback. The actual costs to you could vary considerably (either greater or lower than these estimates) depending on your choices as you progress through the course. We set out where we can, based on experience, where these indicative costs are for activities that are optional or compulsory. All our students are provided with 100 free pages of printing each year to a maximum total value of £15. The cost of accommodation and other living costs are not included within your course fees. More information on the cost of accommodation can be found in our accommodation pages. The additional costs listed here are to be used for indicative purposes only and are based on the additional costs for the 2018/19 academic year. The additional costs for 2019/20 will be published as soon as possible. If you've got no idea where to start or just want to check you're on the right track, we’ve got expert advice and real examples from our students to help you nail your personal statement. You can even download our ultimate personal statement guide for free. We offer further information on possible undergraduate financial support. This includes the type of loans, grants and scholarships available both from the government and from Birmingham City University. You will be offered free admittance to the National Annual Professional Conference. You will receive a contribution towards the cost of the student uniform. In your first year you'll gain the basic background understanding of the philosophy and methodology of Conductive Education, and start to learn about neurological movement disorders and begin to understand how these impact on the lives of children and adults. Alongside this theoretical knowledge, you'll begin the process of developing a range of professional skills all leading to teaching children/adults how to develop skills including movement, confidence, understanding and communication. In Year two, theory and practical skills will start to merge – and we’ll expect you to plan and lead programmes and sessions for either children or adults, under the supervision of a qualified conductor. In Year three, it's all about having increased responsibility in conductive groups under distant supervision from a conductor. You'll extend your knowledge and understanding of motor disorders, conductive practice and the work of the professionals in the field. These theoretical concepts will be fused into practical application and you will undertake an independent piece of research. Practice: NICE (Birmingham) with the opportunity to attend off-site placements in the second semester. Theory: to conductive education, neurological conditions, motor learning theories with relevance and a strong link to the practical experiences. Project work: students are expected to develop a strong theory-practice link, in preparation for employment in which they will develop skills to facilitate reflection of practical skills in the light of theoretical underpinnings. In second and third years, students are expected to identify an area of specific interest which they will then research in greater depth, by the end of which they will have produced a short dissertation. You will have two days of lectures per week as well as two days in your practice placement. You will have the opportunity to do placements as blocks (two, three or four weeks), or regularly on a weekly basis. In the first and second year, teaching is weekly (two days a week) whilst in year, as preparation for employment, teaching will be delivered in blocks (15 days a semester in three-day blocks). Students work in pairs and small groups, preparing together presentations, posters and discussing topics of academic and practical relevance. Students are encouraged to video their own practice based skills, sharing their opportunities and learning with the group. Students are enabled to discuss their research projects and topics for research in a supportive and friendly environment. Students are encouraged to participate in the annual student conference, and the college newsletter, as well as CE awareness week and other related professional activities. Everyone on the course had such a passion for what we did that friends for life were made. The provisions at the institute where most of the training takes place are really good. We received constant feedback, everyone knew your name and you became a part of the team. The students graduating from this BA course will be granted opportunity to join the UK, professional body; the PCA (Professional Conductors’ Association). Membership of this association will provide newly qualified conductors support and connections to other conductors working within the UK. With affiliated membership it is also possible for conductors working abroad to join and participate in PCA conferences and access publications, CPD and links to current thinking and research. Membership is respected by employers and conductors both within the UK, and abroad. If you are interested in undertaking part of your studies abroad, the Erasmus scheme may be of interest to you. It allows higher education students to study for part of their degree in another European country. It is open to undergraduates in their second year (or above) and offers a unique opportunity to enhance your CV and experience new cultures. If you study with us you will have access to an Erasmus co-ordinator, who can provide information about which institutions we have links with. Graduates wishing to undertake further study will be able to access Birmingham City University postgraduate courses and modules e.g. MA in Conductive Education, MA in Special Needs. You will have the chance to visit other Conductive Education centres as part of your course. On successful completion of the course you will be qualified to work in centres and schools where Conductive Education is practiced. These are available worldwide and offer an opportunity for graduates to seek employment in different countries or cultures if wanted. 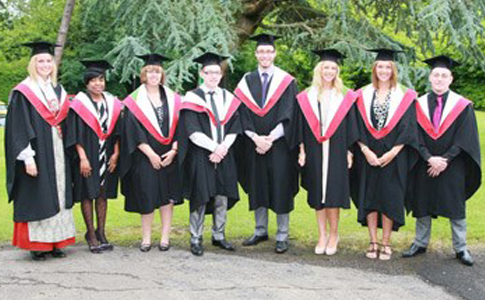 Graduates are also able to enrol on a PGCE course or teacher training programme and gain this qualification. Graduates will not only have an honours degree, but also a professional qualification; Qualified Conductor Status (QCS). This will reflect their experiences and enable them to find employment in a range of CE settings, potentially working with children and / or adults with physical disabilities. This can lead to employment in many different areas of work e.g. CE focused schools and centres, other charitable organisations, self-employment and teaching. One of the most distinctive features of our Conductive Education BA (Hons) is that you are part of the team from the moment your first term starts; expect to be helping individuals from your very first week. This immersion into the delivery side of our work is consistently rated as one of the most attractive aspects of the course, as it ensures you are fully fit to practice professionally from the day you graduate. You will undertake practical placements in groups with children/adults as an integral part of the course. These are available at specified centres across the UK. You will be given advice and support when seeking options for practical placements. You will work as a part of a professional team for two days each week and will have the opportunity to join in professional development activities with staff at The Conductive College. You will also have free access to the annual National Conference on Conductive Education which is held at varying locations across the UK. You may wish to take employment as an assistant in Conductive Education summer schools nationally or internationally. A dedicated website is available for students seeking work both in the UK and abroad. This was a life-changing course. It provided me with skills I could use for my future career and an aspect towards disability which I never thought possible. I am so proud to be able to call myself a conductor and help the children and adults I now work with in such a positive way. Through our courses we give you the skills and experience needed to get a head start when applying for jobs. But we offer something extra too – Graduate+. Our unique programme gives you the chance to develop valuable skills outside of the more formal classroom learning. We award points for Graduate+ activities (including firewalking!) and these can be put towards a final Graduate+ award. So far 100 per cent of our students have found satisfying careers in the small but vital and growing profession of Conductive Education. Typically, this means being employed in Conductive Education centres in the UK and around the world including New Zealand, Australia, the USA or Canada, where the March of Dimes programme has attracted some of our alumni. Some of our graduates opt to use the BA as the basis for a Postgraduate Certificate of Education and enter the teaching profession. Graduates of our BA (Hons) in Conductive Education can work all over the English-speaking world, as apart from a facility in Hungary we are the only open access English speaking course. The course is based on acquiring the skills for a vocational profession. Qualified Conductor Status (QCS) is a worldwide recognised professional qualification and enables graduates to be employed as a conductor. Birmingham City University is one of the largest providers of nursing and healthcare education in the UK, with more than 7,000 students. That means if you choose to study here, you will have access to some of the most advanced training and education facilities available. This course is based at the education charity National Institute of Conductive Education (NICE) in Moseley, Birmingham, while practice can take place at other conductive education centres across the UK. We invest in a great learning environment to give you the best educational experience we can. We have a small team of four qualified conductors and one strategic manager. The conductors all teach both undergraduate and post-graduate students, and have opportunity to continue their practical knowledge, as well as develop their teaching and theoretical skills. We are a strong group, all of us having a minimum of 10 years conductor experience. Our CEO is on this team, ensuring standards of practice and teaching are maintained. We are a ‘hands on’ organisation, where everyone has a role and supports each other. We have a strong commitment to ensuring the ongoing development of CE, both in terms of practical and theoretical underpinnings. We know our students well and take personal pride in delivering knowledge and skills, adapting to the ever changing needs of students in the 21st century.